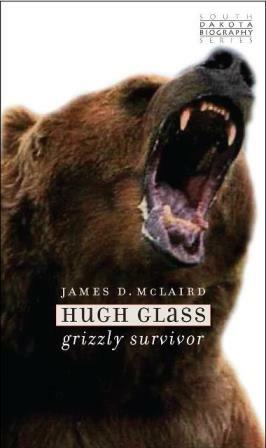 This spring, readers will be able to learn the true story behind frontiersman Hugh Glass, who is currently portrayed by Leonardo DiCaprio in the Hollywood blockbuster “The Revenant.” As Oscar buzz continues to mount for the movie, the South Dakota State Historical Society is getting ready to release “Hugh Glass: Grizzly Survivor” by James D. McLaird in May. The most famous grizzly bear attack in the history of the American West took place in 1823 and left Glass struggling for life. Setting out on a journey of revenge and forgiveness, he eventually crawled 200 miles across the plains back to civilization. The story of Hugh Glass has provided fertile ground for articles, books and film, but the real man remains much a mystery. McLaird, a Mitchell historian, traces the few existing threads of Glass’ life and delves into the role of popular history in making a legend. He also looks at the grizzly bear itself, examining popular sentiments towards the creature that led to its near extinction. McLaird is professor emeritus of history at Dakota Wesleyan University in Mitchell. He is the author of the second South Dakota Biography Series book “Wild Bill Hickok and Calamity Jane: Deadwood Legends” and numerous articles on the Black Hills and American West. “Hugh Glass: Grizzly Survivor” is the latest addition to the South Dakota Biography Series published by the South Dakota Historical Society Press. The book will be available in May for $14.95, plus shipping and tax. It can be preordered directly from the South Dakota Historical Society Press at www.sdhspress.com or by calling (605) 773-6009. Follow the South Dakota Historical Society Press on Facebook (SDHS Press) and Twitter (@sdhspress) for more information. Editor’s Note: Email jennifer.mcintyre@state.sd.us for publicity information and to contact the author.